SOLD La Perse, La Georgie, LA Natolie, Les Arabies, L'Egipte et le Cours du Nile.. Title: 'La Perse, La Georgie, LA Natolie, Les Arabies, L'Egipte et le Cours du Nile.. '. 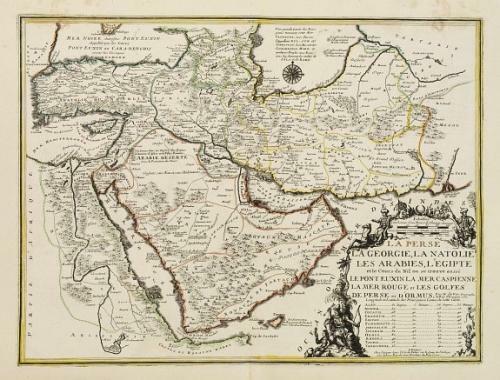 A scarce regional map showing the Asian territories of Ottoman Empire with emphasis on the course of river Nile. The map has an elaborate cartouche showing the ethnic population of the area. In very good condition, Good and dark impression. Marginal faint brown stains in the upper corners, affecting the border frame. Rare.